The judge is the one who decides between opponents, as mentioned in the Qur’an, “..appoint two arbiters, one from his family, and theother from hers.” (NISAA’, 35) , “Say, Shall I seek for judge other than God?” (AN‘AM,114); the judge also rules and governs, as in, “..and whenye judge between man and man that ye judge with justice.” (NISAA’, 58). Allah’s Will is carried out according to His Plan, He says about Himself, “..for God doth command according to His Will andPlan.” (MA’IDA, 2), “..and be patientand constant till God do decide, for He is the Best to decide.”(YUNUS, 109), “..and Thou art the Justest ofJudges!” (HUD, 45). The word hakam denotesthe perfection of what is done, Allah says, “..and God willconfirm and establish His Signs” (HAJJ, 52). The judge is also the one whom people resort to for judgment, “..their real wish is to resort together for judgment in their disputes to the Evil One.” (NISAA’, 60). The Arabic word hokm, which means judgment, is related to wisdom and judiciousness, knowledge, sovereignty, and deciding between people, “..to each of them We gave judgment and knowledge.” (ANBIYA’, 79), “..We did witness their judgment.” (ANBIYA’, 78). 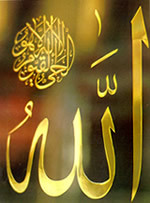 The judge whose judgment can never be turned back is Allah; He says, “..the Command rests with none but God.” (AN‘AM, 57), He settles matters between His creatures, decides between truth and falsehood, He rights wrongs, distinguishes between the righteous and the evildoers, treating fairly every soul in accord withits deeds; never will Allah fail His promises, nothing can blemishHis Divine acts; Allah judges between hearts, granting them contentand bliss, between souls by guiding them to obedience and to the rightway; Glory be to the JUDGE, Praise and Glory be to Him, He is Allah.